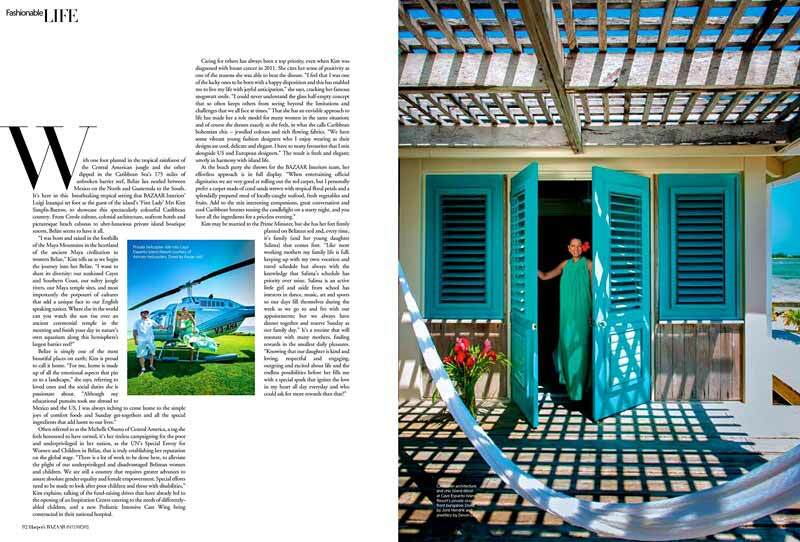 Register Log In AmbergrisCaye.com Home Forums Ambergris Caye Harper's Bazaar Interior features Belize! 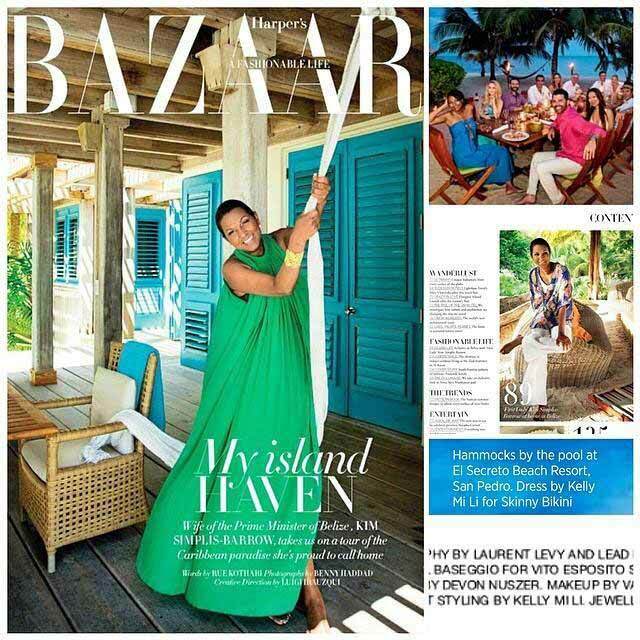 Take a look Behind The Scenes at HARPER'S BAZAAR INTERIORS: KIM SIMPLIS' BELIZE April 2014 Photo shoot produced by Harper's Bazaar International Style Editor LUIGI IRAUZQUI and be part of this breathtaking pictorial adventure: from the tropical Central American jungles to the turquoise waters of the Belizian Caribbean Sea. With 175 miles of unbroken barrier reef, Belize is rustic, breathtaking, full of Caribbean flavor and adventure but also sophisticated, exclusive and surprisingly glamorous. 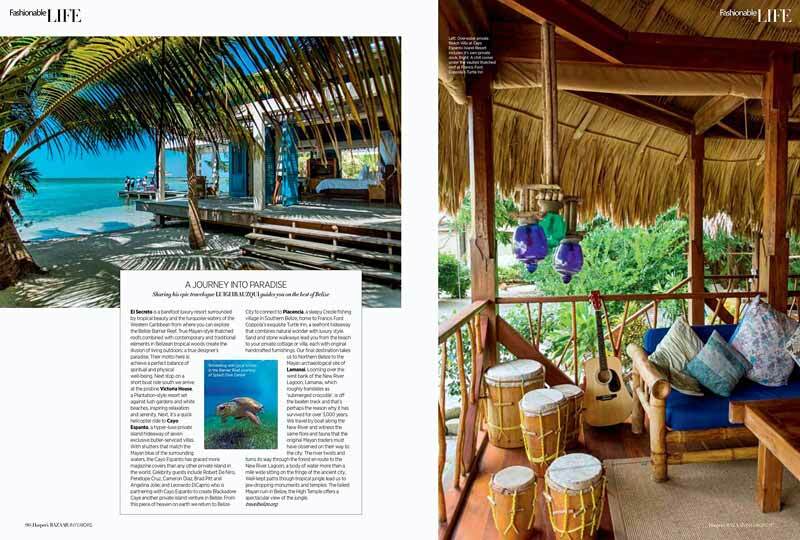 HARPER'S BAZAAR INTERIORS captured the essence and magic of Belize for it's annual TRAVEL ISSUE on stands May 2014. 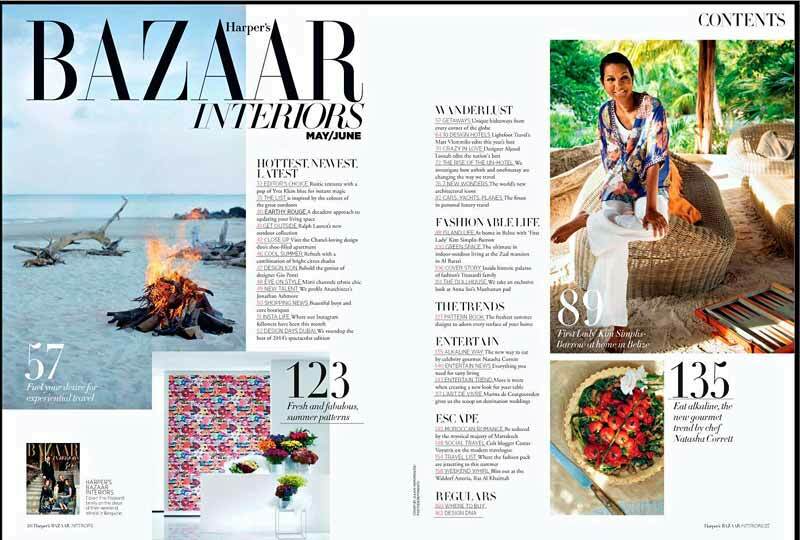 The May/June 2014 issue of Harper's Bazaar Interior is out! 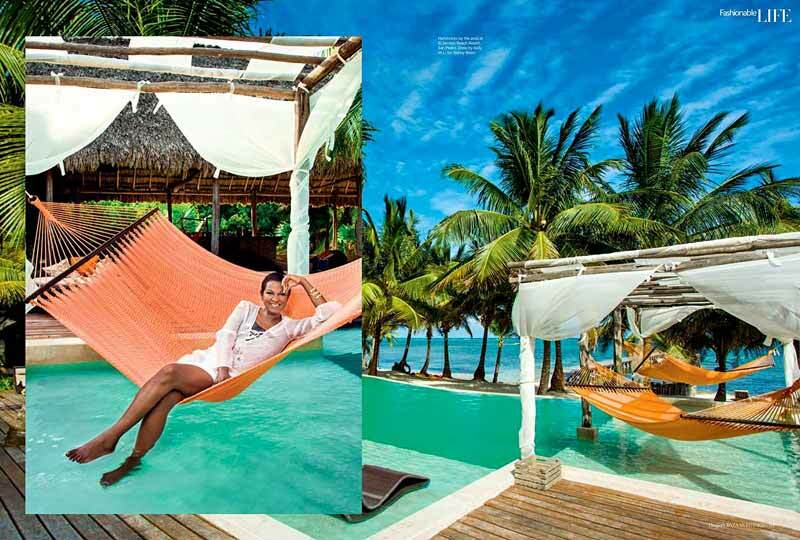 So honored to be apart of this 10 page spread shoot of the stunning First Lady of Belize Mrs. Kim Simplis and our beautiful country - BELIZE! 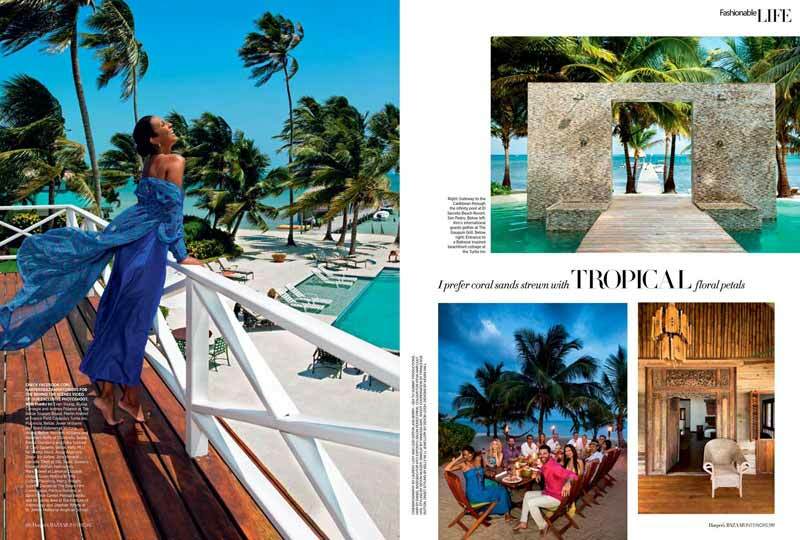 BELIZE is featured in an 11 page spread in this May/June issue of Harper's Bazaar Interior, and the introduction to our beautiful country is undertaken by Special Envoy for Women and Children, Mrs. Kim Simplis Barrow. The issue which features unique establishments and destinations across Belize includes an interview with Mrs. Barrow about her work as an effective advocate for child protection, cancer awareness and various other causes. The Tourism Industry is such an integral part of our growing economy and we will certainly benefit from the exposure Belize will receive being featured in a magazine with the prestige and audience of Harper’s Bazaar. There are many wonderful people to thank; starting with the hotels who immediately bought into the idea and where thrilled to be featured. Thank you to the management and staff of El Secreto, Victoria House, Cayo Espanto and Turtle Inn. Thanks also to the production team: creative Director - Luigi Irauzqui, photographer - Benny Haddad and cinematographer - Laurent Levy. Francesca Dutton and Kelly Mi Li for Skinny Bikini and hair stylist, Daniel Baseggio, thank you! We are also very proud to say that our very own Belizean makeup artist, Vanessa Awe and Joris Hendrik Design were a part of this Belize feature; thank you both. 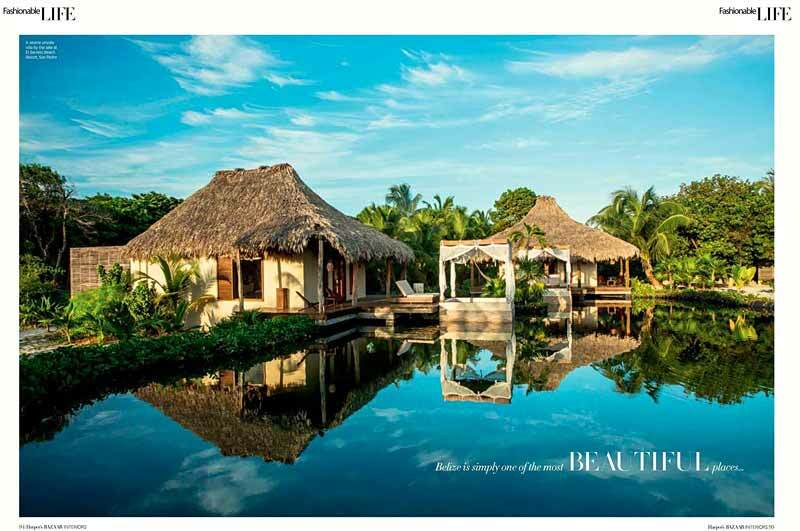 Thanks, of course, to the Belize Tourism Board and a very special thanks to Rue Kothari – Editor of Harpers Bazaar Interior. Very very special thanks to: Abraham Roffe, Jeff Gram, Martin Krediet, Janet Woolham, Allysa Carnegie, Evan Young, Mick Fleming and Lucy Fleming at The Lodge at Chaa Creek. THANK YOU ALL. Let’s celebrate our beautiful Belize! "it gives readers a closer look at the simplistic, yet cultured lifestyle of Belizeans, depicted through the eyes of Mrs. Kim Simplis Barrow." Wow, and here we were, thinking (simplistically of course) that self-promotion had somehow magically blended with tourist promotion. The magazine features Victoria House, El Secreto, Cayo Espanto, Turtle Inn, Silk Cayes & Splash Dive Center, Lamanai Archeological Site and Lamanai Outpost. And how much did it cost? The release says, quote, "Similar to what we do with dozens of publications every year, the BTB provided local in country support to Harper's Bazaar Interiors, at a cost of $25,000 US dollars. Director of Marketing Alyssa Carnegie, is quoted as saying "If we were to pay for an advertisement of this nature, it would have cost us over $400,000 US dollars, and for this reason BTB welcomes low-cost high value opportunities." 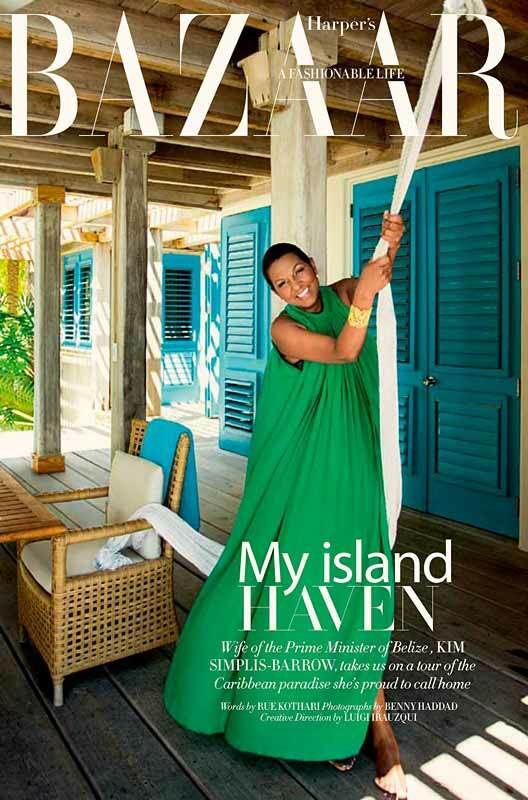 We note that the US East coast, which is Belize's number one tourist market is where you're least likely to find a copy of Harpers Bazaar interiors on bookshelves. The magazine is available primarily across the Gulf of the US, with regional distribution in the United Arab Emirates, Oman, Qatar, Bahrain, Kuwait, and Lebanon.